Everybody who likes being presentable can never deny the importance of clean ironed laundry in their closet. This has led to an iron being one of the most important appliances inside a modern home. A quality iron can definitely make a difference to those crumpled garments. >> Checkout our other article on Best Irons in India. But banishing those stubborn wrinkles with a dry iron is task. With steam irons, getting rid of tough creases is a piece of cake. Which is why today we are looking at the 5 best steam irons in India. 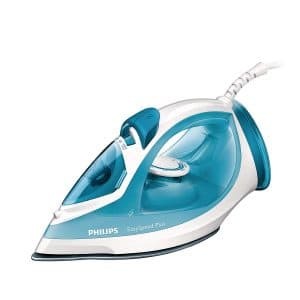 At number one, we introduce the Phillips ES Plus GC2040 as this steam iron is a true all-rounder when it comes to light to heavy steam ironing. With a steam output of 30 gm to 100 gm per minute, get rid of even the most difficult creases with just a caress. 360-degree swivel cord and vertical steaming makes vertical ironing a walk in the park. Drip stop system works perfectly even in low temp scenarios. Triple precision tip, non-stick soleplate and a 2-year warranty should serve you well for some time to come. Drip stop at low temperature. Requires 15 amp plug socket. While we have put Havells Sparkle 1250-watt iron at number 2, it is by no means deficient in its features and performance. 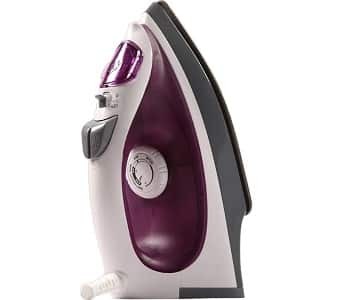 It comes with a non-sticking soleplate, 230 ml water tank, separate steam settings for different fabrics, dry and steam ironing setting, ergonomic design and low wattage. The Sparkle can handle all types of fabric with ease and provide you with crisp wrinkle free clothes every time. Excellent build quality ensures minimal water leakage from inner tank. Low power consumption is light on your power bills. High water capacity at 230 ml. Ergonomic design easy to hold and use. Different settings for different fabrics. Supports both dry and wet ironing. Low power consumption 1250 watts. After sales service is not the greatest. Pricing slightly on the higher side. The Titanium from trusted Indian home appliances brand Inalsa is an extremely high quality product you can own at a reasonable pricing. The titanium coated non-stick soleplate is perfect for all types of ironing needs. The steam settings ensure there is an output of 22g to 160g of steam every minute based on how fast you need your clothes ironed. 360-degree swivel cord takes care of vertical ironing with ease. It is one of the few steam irons that handles hard water. Just turn the anti-calc option on and you are good to go. All of this come along with a whopping 300 ml water capacity inner tank. The anti-drip function stops water drops while steaming. 360-degree swivel cord for vertical ironing. Build quality not the best. 2000 watt of power consumption can be high. 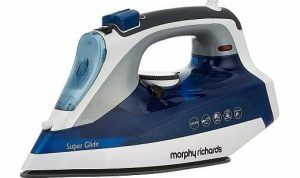 The Super Glide from internationally acclaimed Morphy Richards brand is a robust steam iron that can effortlessly support both light and heavy ironing. 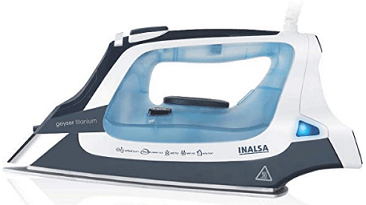 The long and flat soleplate with 46 steam vents can dispense up to 11 gm of steam during every ironing session. This results in great results every time no matter how tough the fabric is. A 360-degree swivel power cord with steam blast feature makes vertical ironing a joy. 46 steam vents make for better ironing. 360-degree swivel cord is perfect for vertical ironing. Steam blast for vertical ironing. 2000 watts of power consumption can be heavy on the pocket. 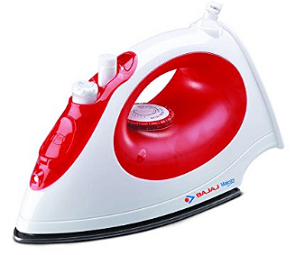 A trustworthy name in the Indian electrical appliances market, Bajaj’s steam irons have been a part of many households for decades now. The MX15 is another perfect offering for the Indian market. It is lightweight yet sturdy and holds 170 ml of water in the tank. Transparent water tank tells you exactly when you have to refill. Non-stick soleplate handles each type of fabric with ease and you can get the best ironing very time. These qualities make it one of the top 5 best steam irons in India. Consumes only 1200 watts of power, lowest amongst the top steam irons. Holds 170 ml of water in a transparent tank. Non-stick soleplate handles all types of fabric. The plastic body is lightweight but is prone to damage. Steam settings do not operate as efficiently as expected. In conclusion, while each of these products can easily claim a place in your home thanks to their dexterity, quality and performance, the Phillips ESP GC2040 stands apart from the crowd thanks to its design, performance, looks, quality and price.